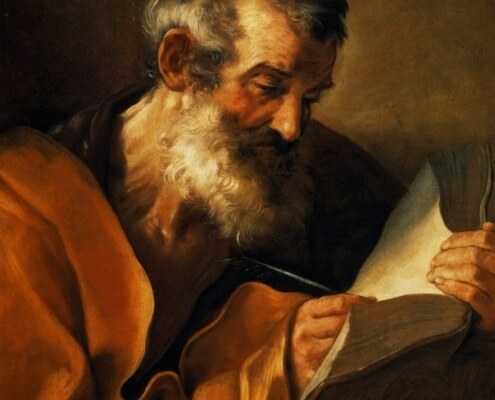 The identity of Mark is unknown but his great book, The Gospel of St Mark, was written in about the year 70 and has had the greatest impact on the world of any book ever written. It has been translated into more languages than any other book in history, as a book of the Bible. It is the first written story of Jesus of Nazareth, a Middle Eastern itinerant rabbi who preached, healed the sick and exorcised demons, caught the attention of the Jewish establishment and was crucified on a Roman cross, thereafter rising from the dead and becoming a god. Originally a character in a work of fiction Jesus has been taken as an historical person and was worshiped by increasing numbers, and is still worshiped as the God, creator of the universe, by billions of Christians around the world. Before the introduction of Jesus of Nazareth into written literature as a character he existed in the letters of the evangelist, Paul, as a vague unrealised figure with no details of his life, and probably also in oral accounts that circulated in the early Christian community. Mark invented the actual character of Jesus, details of the events in his life, and the drama of his arrest, trial and execution at the hands of the Romans. Later writers, Matthew and Luke, copied Mark’s story and added further details of their own. Another writer of the turn of the first/second centuries, known as John, also based his more spiritual account on the broad thrust of Mark’s book. Those four books are collected in the New Testament and are known as the gospels. If it were influence alone that makes a writer great Mark would be placed right at the top of the list. The protagonist of his book has not only been seen as a person in real history, even without any evidence of that, but has been, and is, worshiped as though he actually rose from the dead after his execution and assumed his place as the deity who created the universe. That belief still exists among billions of Christians and has conditioned the world as it is today. Mark’s gospel is not only the most influential book ever written but it is a great work of art, carefully constructed and ending with the beautiful, moving drama of the execution of a noble and innocent hero, a drama which hundreds of great works of literature have echoed and continue to echo.